However, Kenya still faces significant gaps in design and implementation of programs that lead to issues in quality of services and measurement of grant performance. Changes in national governance following constitutional changes in 2010 have compounded these gaps; Kenya has devolved health service delivery from the central government to 47 county governments. Implementers at the county level risk delays in flow of funds from the central level, absorption of funds and subsequent reporting. These are some of the key findings from an audit of grants to Kenya conducted by the Global Fund’s Office of the Inspector General (OIG). A report of the audit was released on 12 November 2018. This article provides a summary of the OIG’s findings. The audit covered grants implemented by the three principal recipients (PRs) - the National Treasury, AMREF Health in Kenya and the Kenya Red Cross Society (KRCS), their sub-recipients, and Kenya Medical Supplies Authority (KEMSA) between January 2016 and December 2017. The audit assessed the efficiency and effectiveness of the design and implementation of the programs, procurement and supply chain processes and systems, grant implementation arrangements in the context of devolution, and frameworks to measure grant performance. The Global Fund classifies Kenya as ‘high impact’ due to its large portfolio and high burden of the three diseases. It has invested close to $1.1 billion in Kenya since 2003. Currently, there are six active grants (see Table 1). Kenya, which is a lower-middle income country, is ranked 146 out of 187 countries in the 2017 United Nations Development Program (UNDP) Human Development Index. It ranks poorly in the Transparency International 2017 Corruption Perceptions Index: 143 out of 180. Kenya adopted a devolved system of government in 2013, following the promulgation of a new constitution in 2010, which led to significant changes within the health sector; county governments are now in charge of health-service delivery, a function previously held by the national government. Health sector programs are negatively affected by challenges in the health workforce in Kenya, which range from a low health-care workers-to-population ratio – 13 doctors, nurses and midwives per 10,000 people, below the World Health Organization (WHO) recommendation of 23 – to frequent strikes by health workers. Objective 1: Design and implementation of the programs to deliver quality services to intended beneficiaries are partially effective. Objective 2: Procurement and supply chain processes and systems in ensuring availability of quality assured medicines and health products to patients are effective. Objective 3: Grant implementation arrangements in the context of devolution including governance, oversight and coordination to ensure sustainability are partially effective. Objective 4: Adequacy and effectiveness of frameworks in place to measure grant performance are partially effective. The OIG noted that Global Fund grants in Kenya are achieving impact: the number of new malaria cases decreased by 47% between 2015 and 2017; AIDS-related deaths decreased by 38% between 2013 and 2015, and the number of people who are on anti-retroviral therapy (ART) increased by 52% between 2013 and 2016. The OIG also noted that Kenya has increased its financial commitment to the three diseases; indeed, the country meets all its counterpart financing commitments and it fulfilled its five-million-dollar pledge to the Global Fund’s 5th Replenishment. Kenya has also developed functional in-country procurement and supply chain systems and processes that allow the country to purchase quality-assured medicines at prices lower than international reference prices, and distribute medicines directly and efficiently to health facilities. Increased risks to grant implementation following devolution of service delivery to county governments. Below, we describe each issue and risk. The OIG identified a number of quality of services issues across the three diseases that need to be addressed if Kenya is to sustain or scale up the progress made so far: for instance, Kenya has consistently failed to meet TB case notification targets in the last three years and, related to this, increase the number of people on TB treatment - treatment coverage is low, 45%, against a recommended target of 90%. The OIG also noted inconsistencies in compliance with national HIV testing guidelines, which was caused by limited training and supervision of staff, and delays in the distribution of mosquito nets – in some counties, net distribution took place during the peak transmission periods, which reduced the effectiveness of the campaign. The OIG reported inconsistencies in the measurement of outcomes and in the reporting of data, which include lack of outcome indicators for some key population groups such as adolescent girls and young women (AGYW) – even though they make up 24% of the grant excluding medicines and commodities – and errors and variances in reported data. The OIG attributed these challenges to errors in the manual aggregation of data, misunderstanding of the indicators at the service delivery level, lack of a unique patient identifier, and inconsistent availability of data-capturing tools. The Secretariat and national TB program had planned an annual data quality audit by the end of 2018. Key population programming is currently based on outdated bio-behavioral data, according to the OIG. Efforts to obtain nationally updated, representative bio-behavioral surveillance data via a survey in 2017 were frustrated by a lack of consensus between the national program and key population groups on the use of biometrics. The OIG also noted that some key components of the AGYW were not implemented as designed. The PR planned for behavioral interventions, meant to complement a cash transfer program, for adolescents 10-17 years old, both in- and out-of-school. The interventions were not effectively implemented; in fact, the OIG reported no progress in ‘in school’ interventions and little progress in ‘out of school’ interventions. For the current implementation period, January 2018 to June 2021, the OIG noted that none of the AGYW interventions had commenced at the time of the audit due to delays in the PR engaging the service providers. Key population programs also face inconsistent availability of selected commodities for diagnosis, prevention and treatment for key populations such as HIV test kits, lubricants, and medicines for sexually transmitted diseases, among others; in fact, during the audit, the OIG noted that all 26 sub-implementers of interventions targeting key populations reported stock-outs lasting longer than 90 days, affecting the consistency and comprehensiveness of services provided. The OIG cited duplication between programs supported by the Global Fund and other health partners and attributed it to limited information-sharing among partners and the absence of detailed donor mapping at the central and county level. The OIG explained that in some instances, donors funded the same implementers for the same interventions, and in turn, received the same results from the implementers leading to over-reporting at the national level. For instance, the Global Fund and two other development partners provide resources to the same 26 implementers for the same interventions for key populations in the same geographical regions; in turn, they receive the same results from the implementers. The National AIDS Control Council (NACC), already aware of this problem, has developed an online reporting platform to track all HIV/AIDS interventions funded by donors in Kenya. However, only a handful of implementers report to the NACC: 12% in 2016, 10% the year before. The OIG underscored the need for engagement of all stakeholders including the government, donors and implementers to address this issue. Kenya is making progress in devolving grant implementation to counties, following the devolution of service delivery to the counties. The OIG warned, however, that this change poses significant risks to grant implementation, due to the increased number of implementers, such as delays in the flow of funds from the central level, the absorption of funds and subsequent reporting by the counties, and the increased workload on the PR’s Project Management Unit, which will now have to supervise and consolidate reports from the 47 counties. Previously, grant activities were being implemented and managed at the national level, based on a national implementation arrangement, by the National Treasury, which is the state PR, or the Ministry of Health that implements grants on behalf of the state PR. The main risk, however, is the lack of capacity by the counties to implement activities and account for grant funds in a timely manner; the audit found that some counties had insufficient finance and program staff, while the county health-management teams have limited experience in planning and budgeting, and programmatic and financial reporting under Global Fund grants. The KCM has proposed a capacity assessment of the counties; however, this is yet to be done. The OIG called for changes in oversight, risk mitigation and assurance arrangements to respond to the changes in the implementation arrangements. To develop guidelines for timely engagement of SRs at the start of new implementation periods with a view to ensuring uninterrupted program continuity. All the AMAs are ‘owned’ by the Head of Grant Management Division; and are due to be completed by 31 December 2019, except for AMA 2 which is due on 31 March 2019. For a table detailing the AMAs, see page 22 of the OIG report. The OIG highlighted Kenya’s procurement and supply chain as a good example of a well-functioning system in a Global Fund country portfolio. This finding is consistent with an analysis conducted by Aidspan on the use of the national procurement authority, rather than the Global Fund’s Pooled Procurement Mechanism (PPM). Kenya is one of the few African countries where the government procurement agency (KEMSA) procures Global Fund-supported medical supplies directly on behalf of the state Principal Recipient; most other African countries procure through the Pooled Procurement Mechanism, a Global Fund initiative created to aggregate procurement orders and negotiate lower prices for Global Fund recipient countries. Contrary to expectation, KEMSA obtains commodities at prices lower than those of the PPM; in fact, the prices were 21% lower than PPM prices for 2016 and 2017, according to the OIG. Kenya’s supply chain is able to distribute commodities to health facilities; the OIG noted that there were no major stock-outs at the service delivery points. This is unlike many countries in the region, whose supply chains remain sub-optimal, according to the OIG 2017 annual report. The OIG attributed KEMSA’s success to government commitment, oversight and stakeholder coordination. 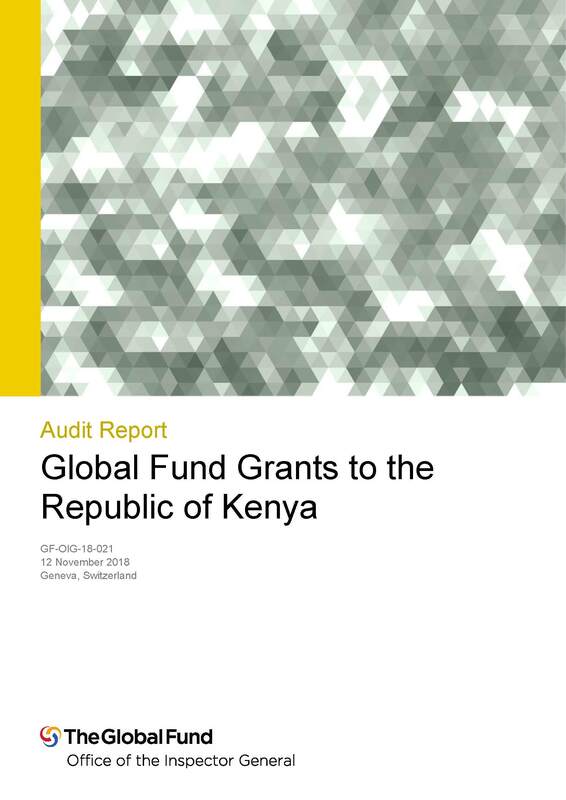 The full report of the OIG audit of Kenya is accessible on the Global Fund website.